Armor, 5" Belt, 8" Turrets, 2 1/4" Deck, 5" Conning Tower. Speed, 32.0 Knots, Crew 800. Fate: Sunk by Japanese gunfire on 9 AUG 1942 during the Battle of Savo Island. 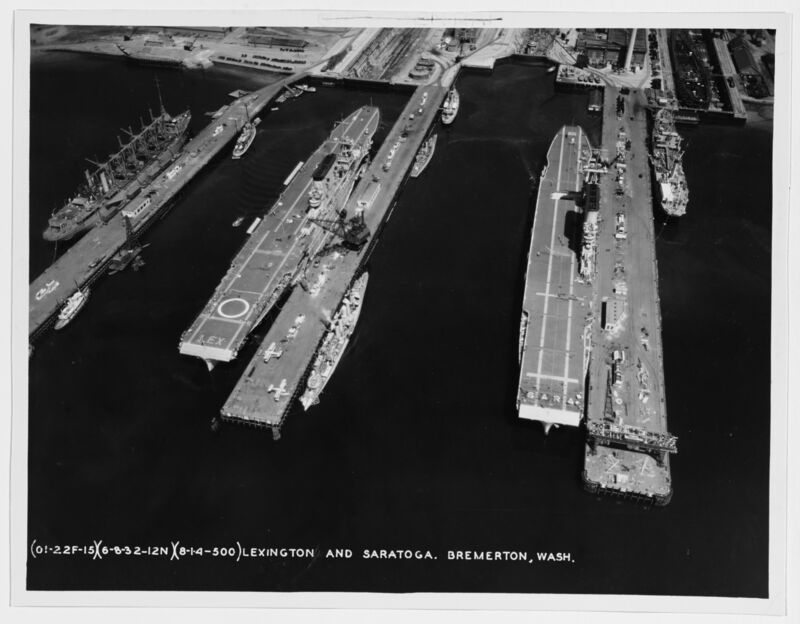 Puget Sound Navy Yard, Bremerton, Washington, The aircraft carriers LEXINGTON (CV 2) and SARATOGA (CV 3) at the yard, 8 June 1932. Also present is an old collier at left. 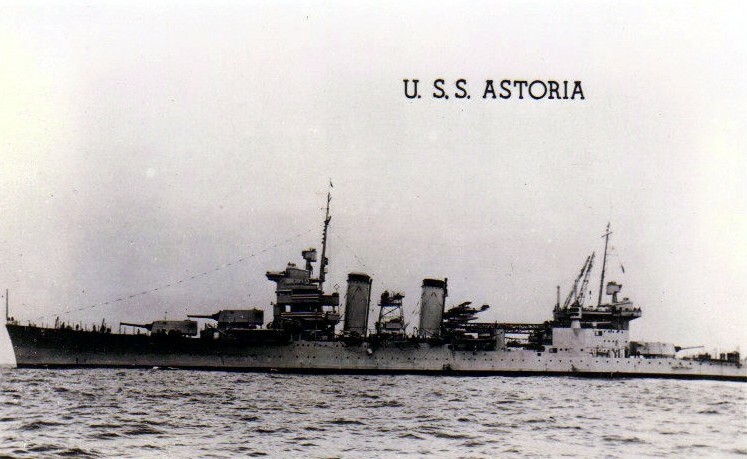 ASTORIA (CA 34) is under construction in drydock, upper right. Photographed from a USAAC plane. 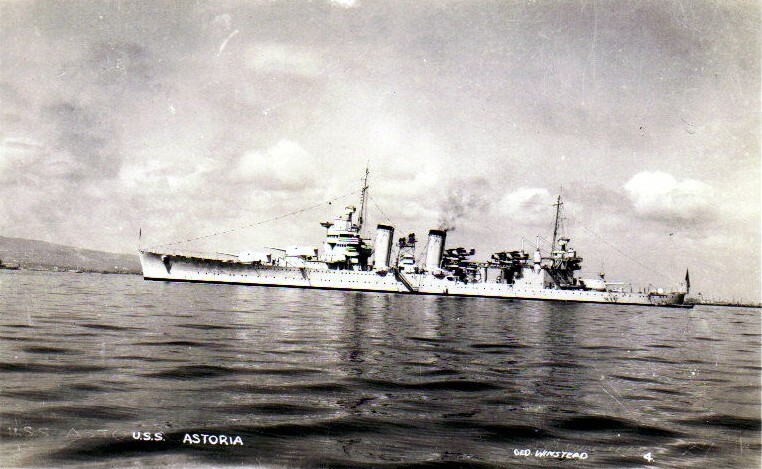 The Christening and "Launching" of Astoria. 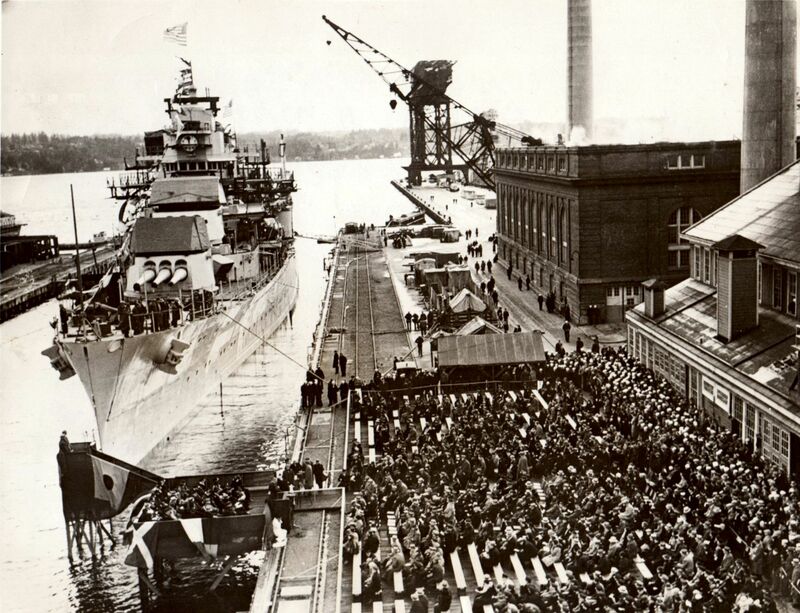 All ships built at Puget Sound Naval Shipyard were constructed in drydock, not on a shipway as in other shipyards. The "Launching" of a ship was just the flooding of the drydock. Astoria (CA 34) fitting out at pier 6, Puget Sound Navy Yard, Washington, 19 December 1933. Port side view, date and location unknown. 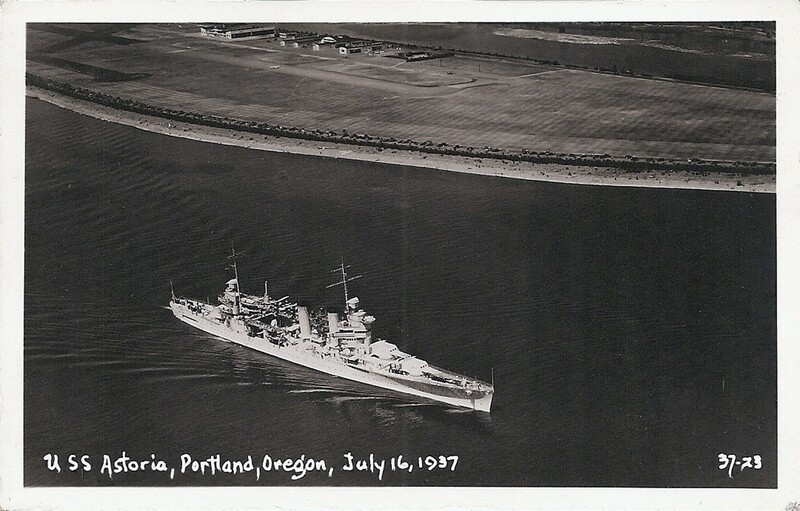 Undated pre-war photo while at anchor, location unknown. 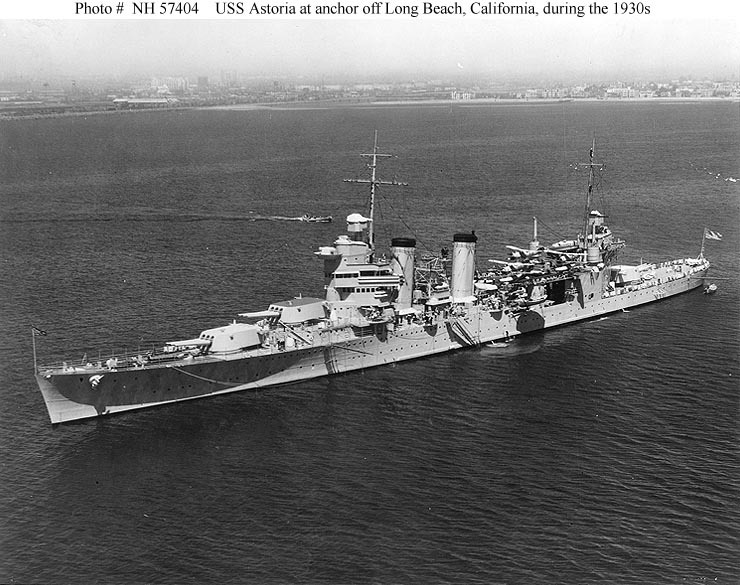 109k USS Astoria (CA 34) entering Honolulu harbor during her shakedown cruise, 9 July 1934. Photographed by Tai Sing Loo. Donated by the U.S. Army Military History Institute, Carlisle Barracks, Pa.
U.S. Naval Historical Center Photograph #NH 91726. 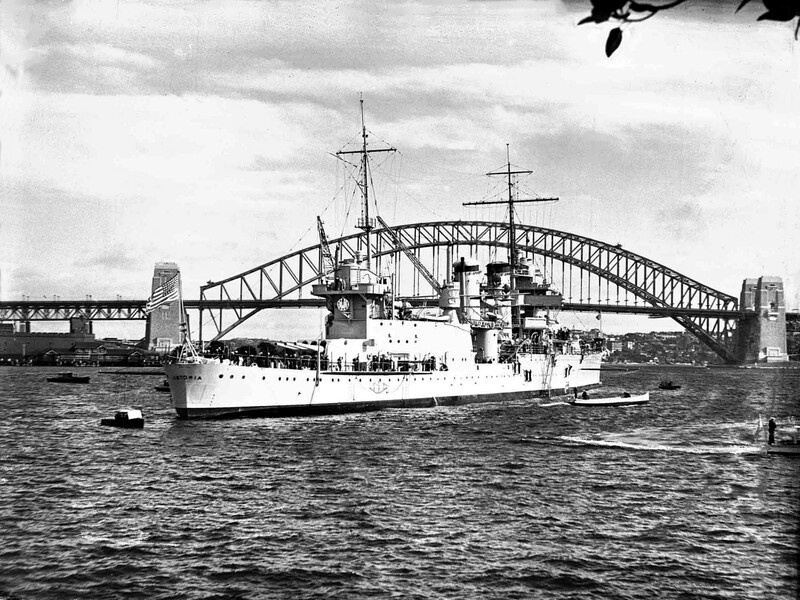 USS Astoria (CA 34) in Sydney Harbor, in August 1934, during its shakedown cruise in the Pacific after its commissioning. Moored, starboard side to, Puget Sound Navy Shipyard, 08 April 1938. 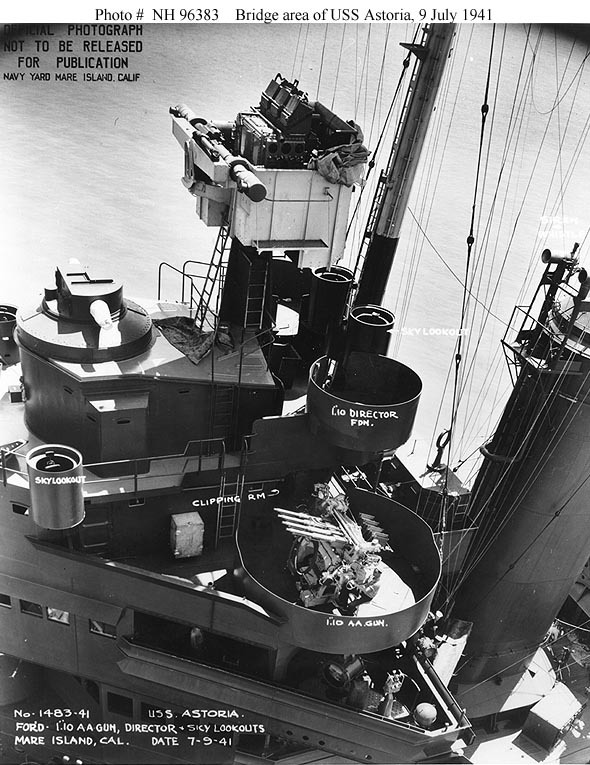 View of fantail, toward the end of the ship's overhaul at Mare Island Navy Yard, on 9 July 1941. Note 1.1"/75-cal. Guns, empty director positions, and crew sunbathing or catnapping, as well as "park benches." Closeup view of the ship's bridge area, taken near the end of an overhaul at the Mare Island Navy Yard, California, 9 July 1941. 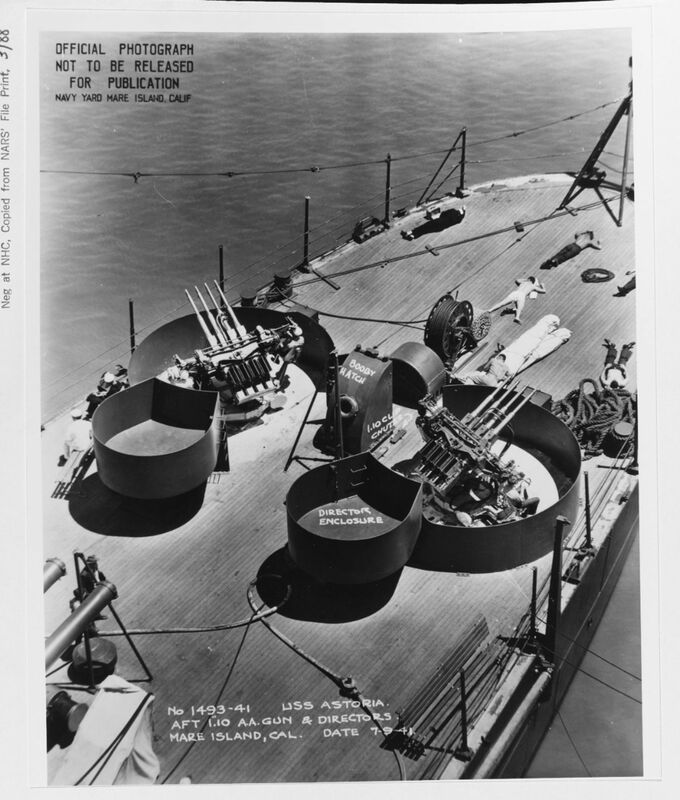 Details seen include: main and secondary battery gun directors atop the battle lookout platform; newly-installed sky lookout position and 1.1" quadruple machine gun mounting; and siren on funnel front. Also note demarcation of dark and light grey paint of the ship's Measure 1 camouflage. U.S. Naval Historical Center Photograph #NH 96383. 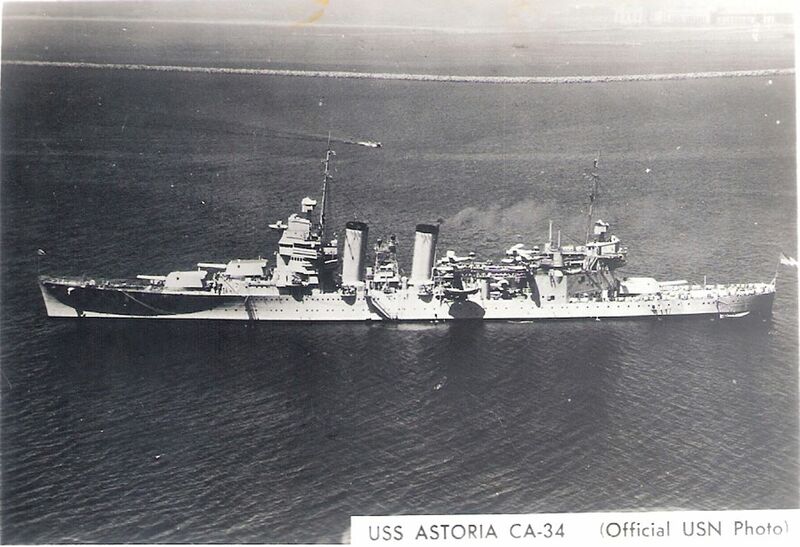 54k USS Astoria (CA 34) off the Mare Island Navy Yard, California, 11 July 1941. Photograph from the Bureau of Ships Collection in the U.S. National Archives #19-N-25346. 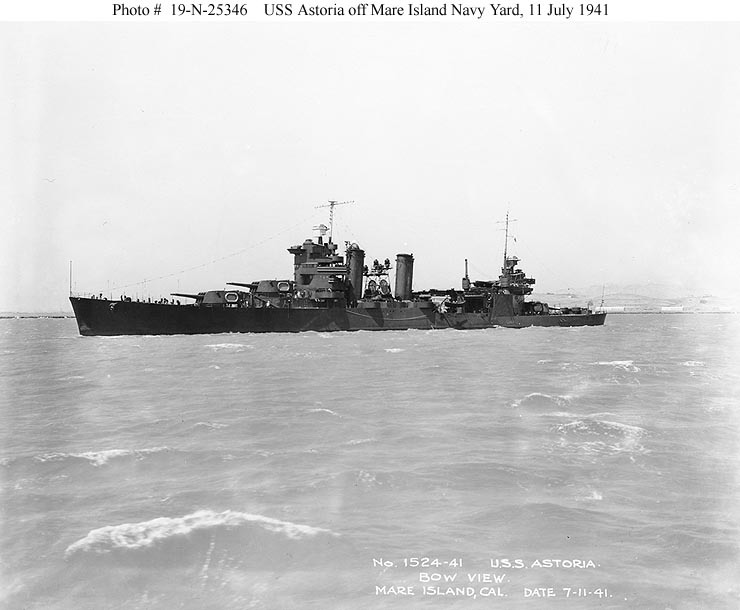 62k USS Astoria (CA 34) off the Mare Island Navy Yard, California, 11 July 1941. 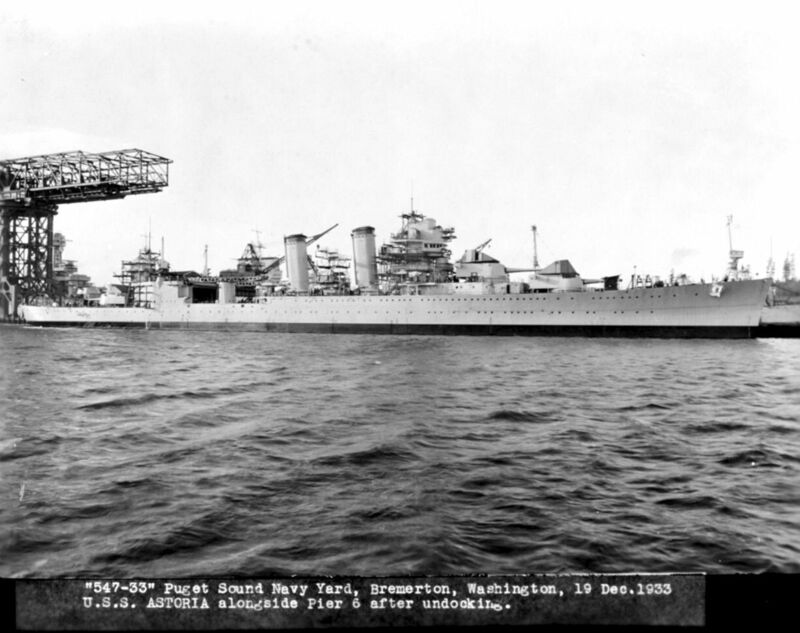 Photograph from the Bureau of Ships Collection in the U.S. National Archives #19-N-25347. 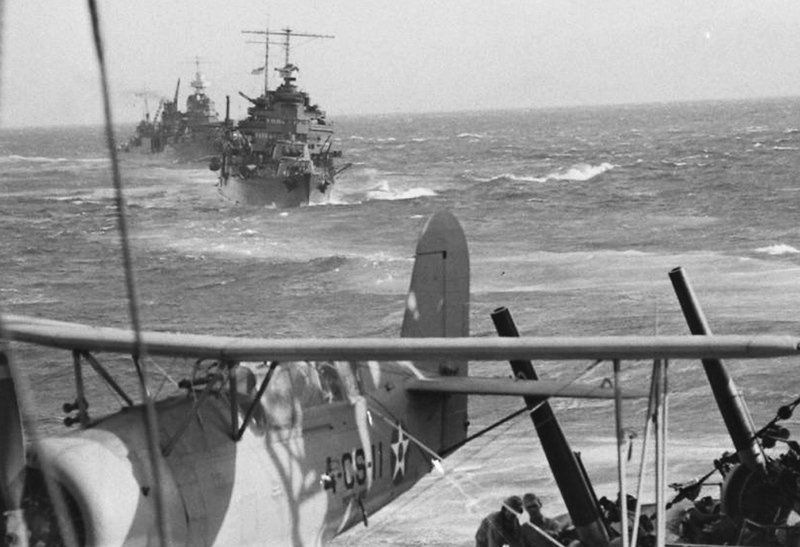 Two days before the Pearl Harbor attack a carrier-cruiser group built around USS Lexington (CV 2) departed Pearl to deliver reinforcement aircraft to Midway. 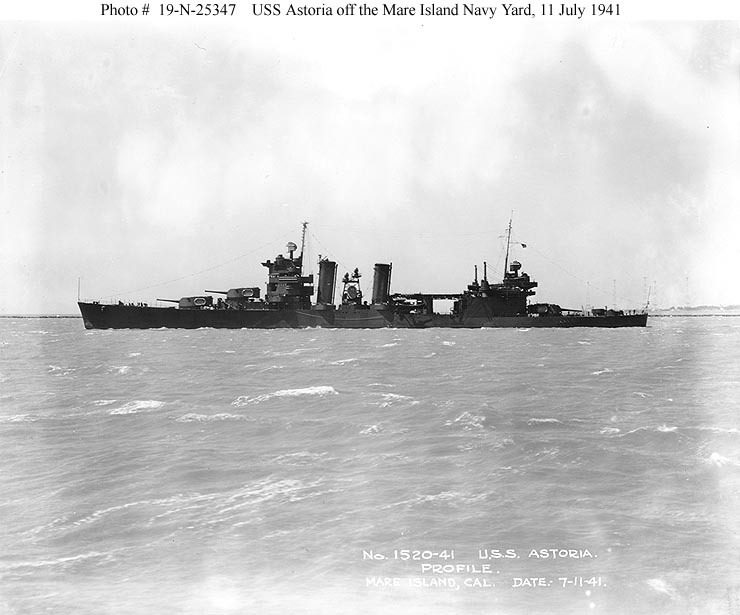 This is USS Astoria underway at sea, as seen from USS Portland. 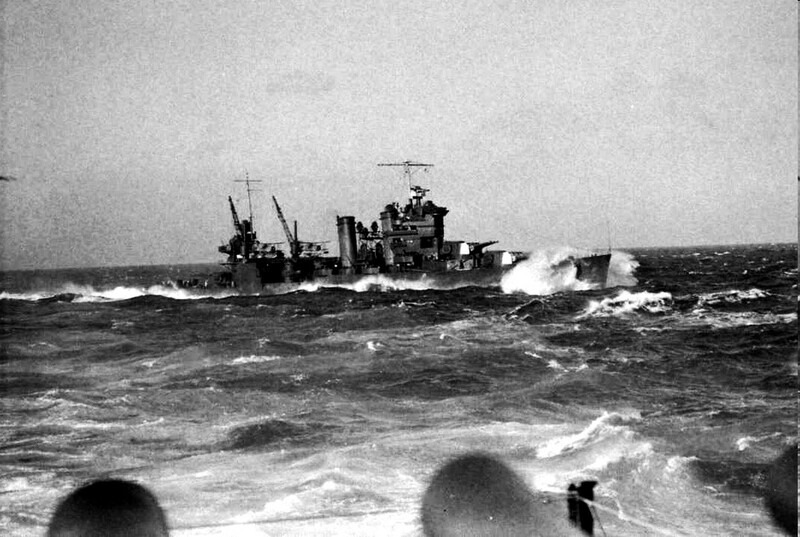 She operated with TF12 from 5 to 13 Dec 1941. 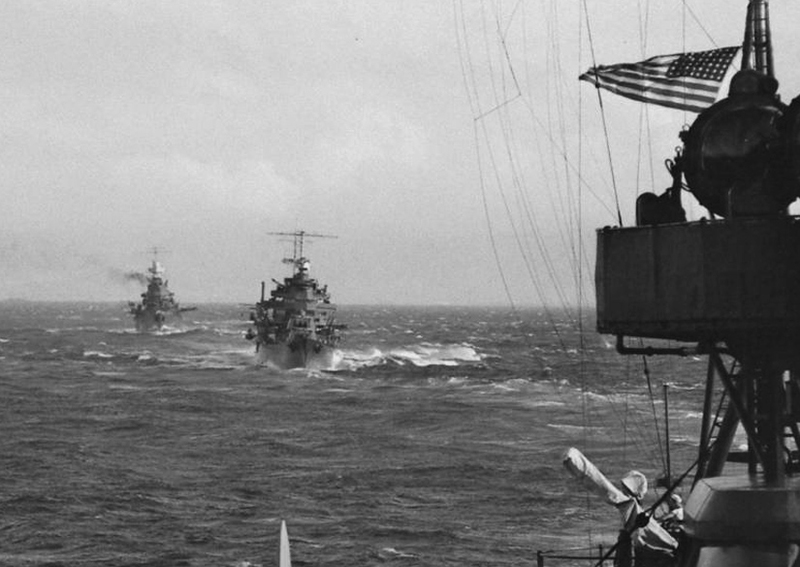 Two days before the Pearl Harbor attack a carrier-cruiser group built around USS Lexington (CV 2) departed Pearl to deliver reinforcement aircraft to Midway. 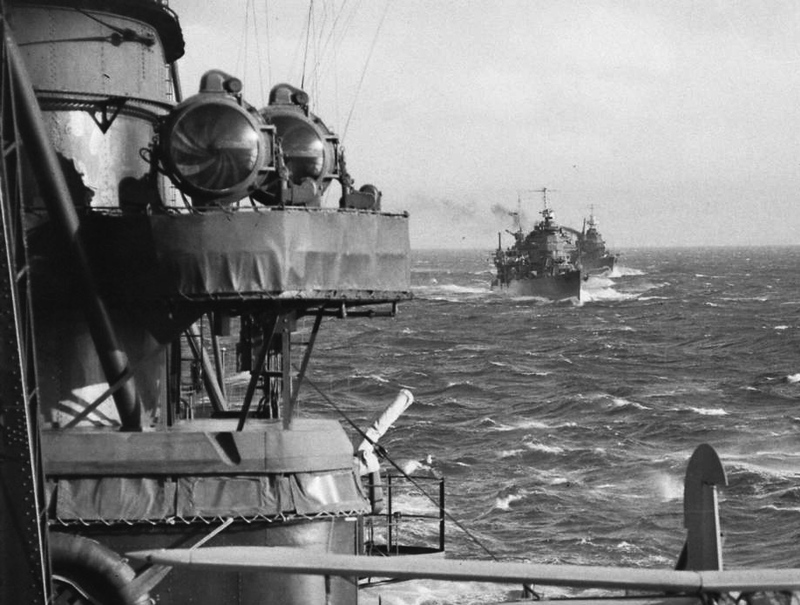 This is USS Astoria and USS Indianapolis underway at sea as seen from USS Portland. They operated as TF12 from 8 to 13 Dec 1941. 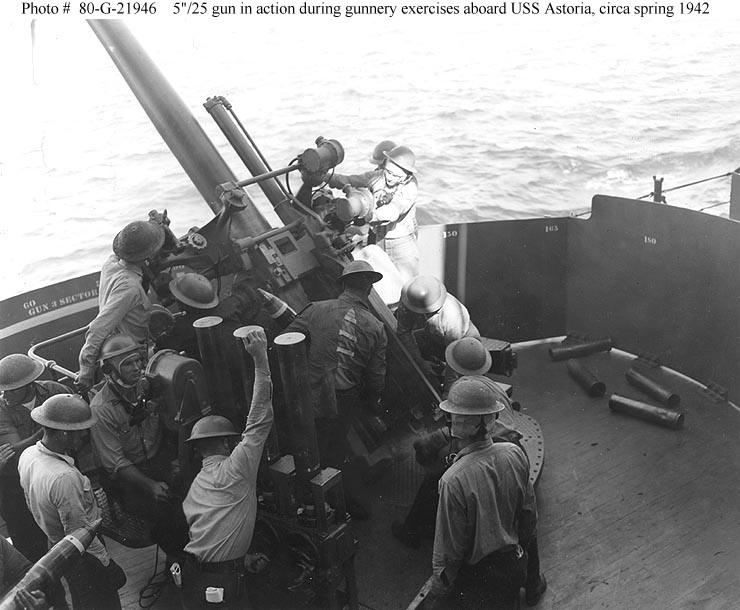 Crew of 5"/25 gun # 3 (2nd gun from forward, starboard side) in action during gunnery practice, circa spring 1942. Note anti-flash head-dress and communications gear worn by the man operating the fuse setter; bearing markings on the gun's splinter shield; and old-style battle helmets. 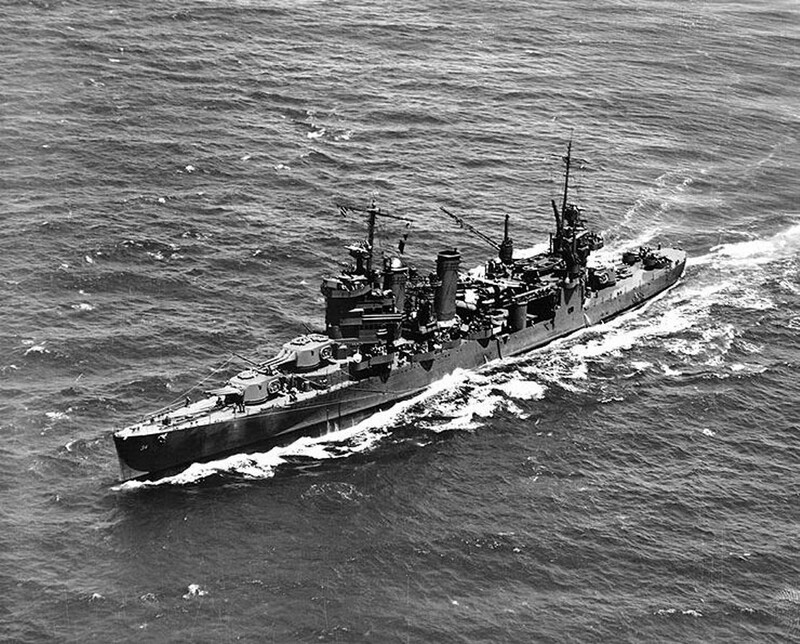 Official U.S. Navy Photograph, now in the collections of the National Archives #80-G-21946. 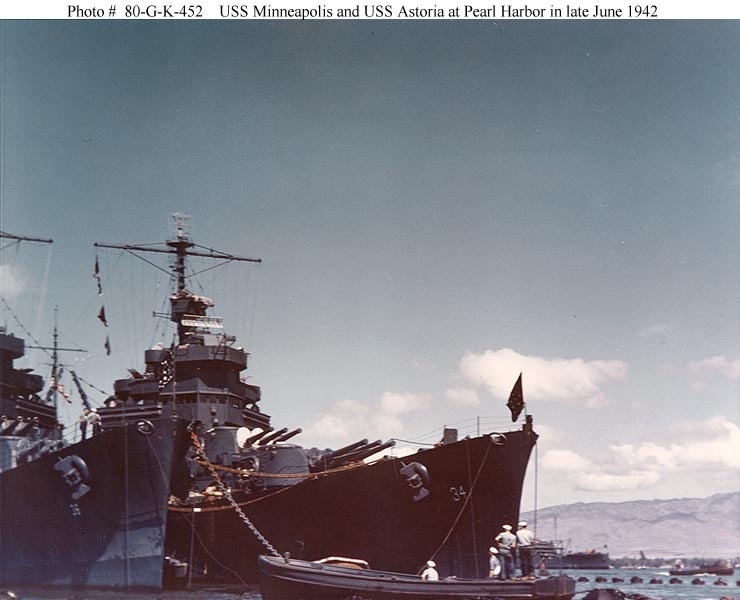 USS Astoria (CA 34) arriving at Pearl Harbor with Task Force 17, 27 May 1942, following the Battle of Coral Sea and shortly before the Battle of Midway. Her crew is in whites, paraded at quarters on the forecastle, and a motor launch is being lowered by her port boat crane. Photographed by Photographer 3rd Class T.E. 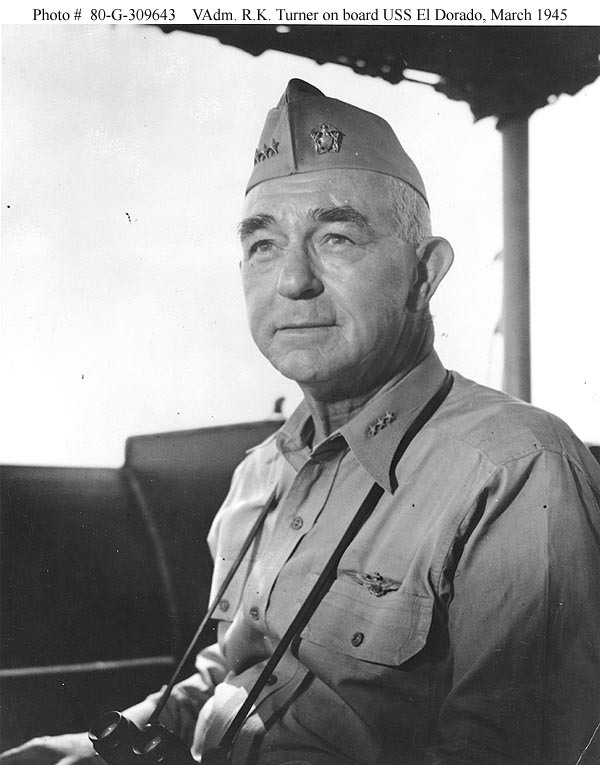 Collins, USN. 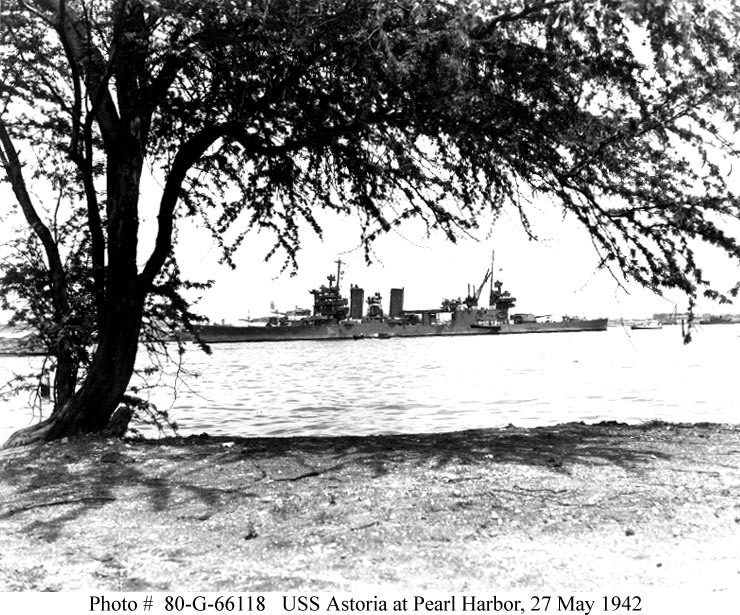 62k USS Astoria (CA 34) (center), and USS Minneapolis (CA 36) (left) moored near Aiea Landing, Pearl Harbor, in late June 1942. 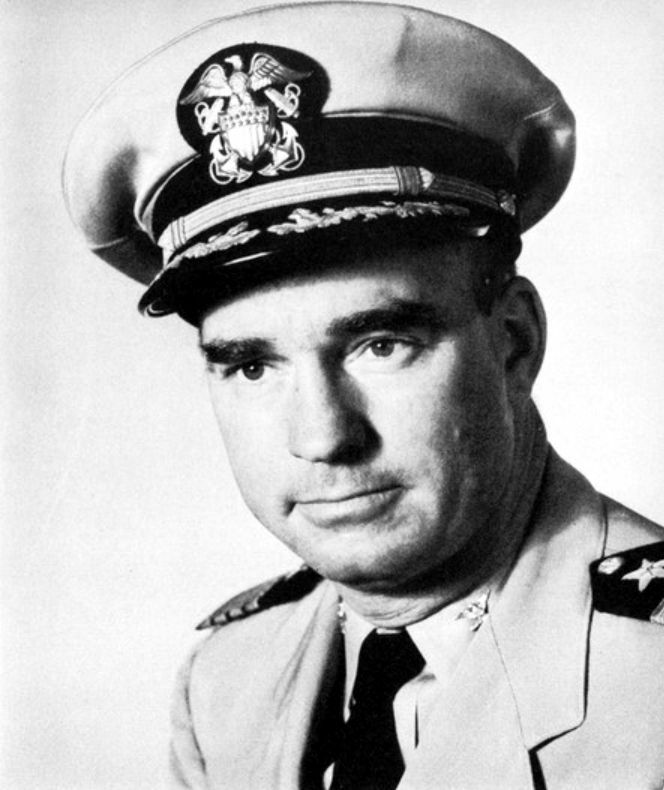 Official U.S. Navy Photograph, now in the collections of the National Archives #80-G-K-452. Battle of Midway, June 1942. A Bombing Squadron Three (VB-3) SBD-3 scout bomber, probably flown by Lieutenant (Junior Grade) Paul A. Holmberg, ditches near USS Astoria (CA 34) at about 1342 hrs on 4 June 1942. This was one of two VB-3 planes that ditched near Astoria after they were unable to land on the damaged USS Yorktown (CV 5). A PBY is flying nearby, in right center. Official U.S. Navy Photograph, now in the collections of the National Archives #80-G-312004. Battle of Midway, June 1942 - An SBD-3 scout bomber, probably flown by the Bombing Squadron Three (VB-3) Commanding Officer, Lieutenant Commander Maxwell F. Leslie, ditches alongside USS Astoria (CA 34) at about 1348 hrs on 4 June 1942. This was one of two VB-3 planes that ditched near Astoria after they were unable to land on the damaged USS Yorktown (CV 5). 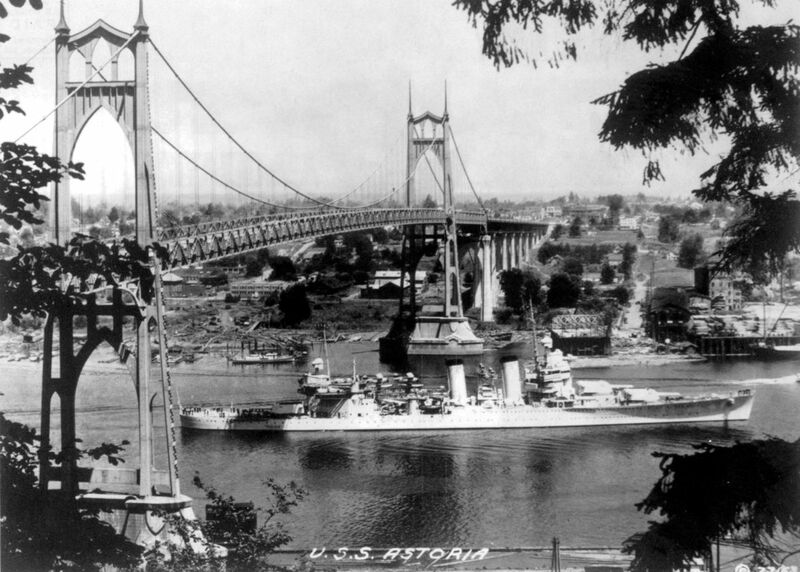 Photographed from atop Astoria's after superstructure. Note her port aircraft crane, and an SOC floatplane on her port catapult. 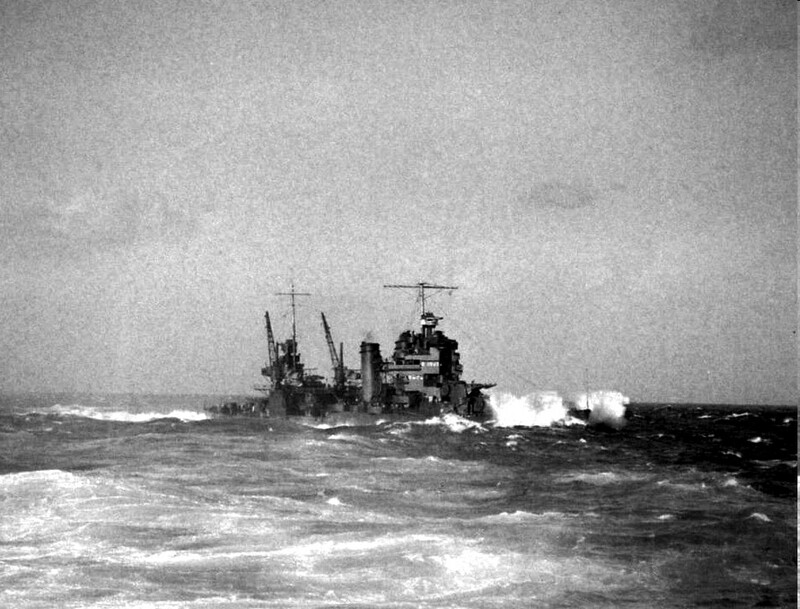 346k USS Astoria (CA 34) operating in Hawaiian waters during battle practice, 8 July 1942. She appears to be recovering floatplanes from off her starboard side. 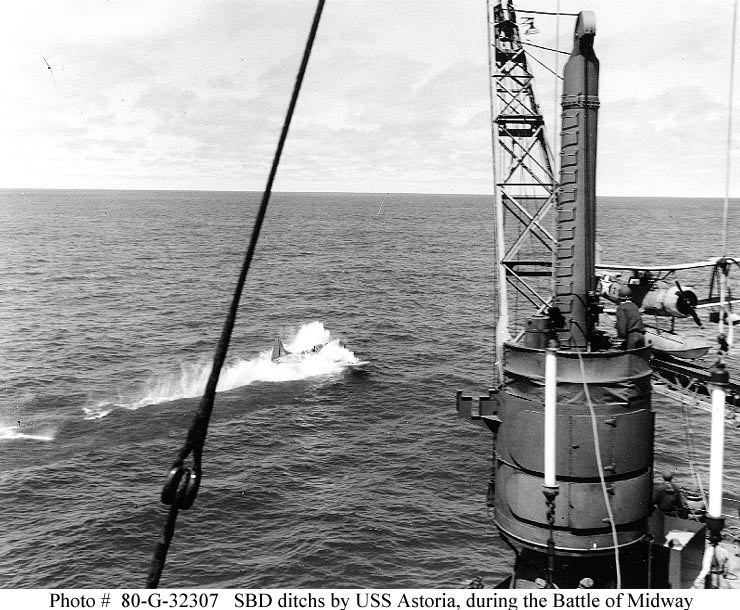 Note booms rigged below the forward superstructure to tow aircraft recovery mats, and starboard crane swung out. Official U.S. Navy Photograph, from the collections of the Naval Historical Center #NH 97682. 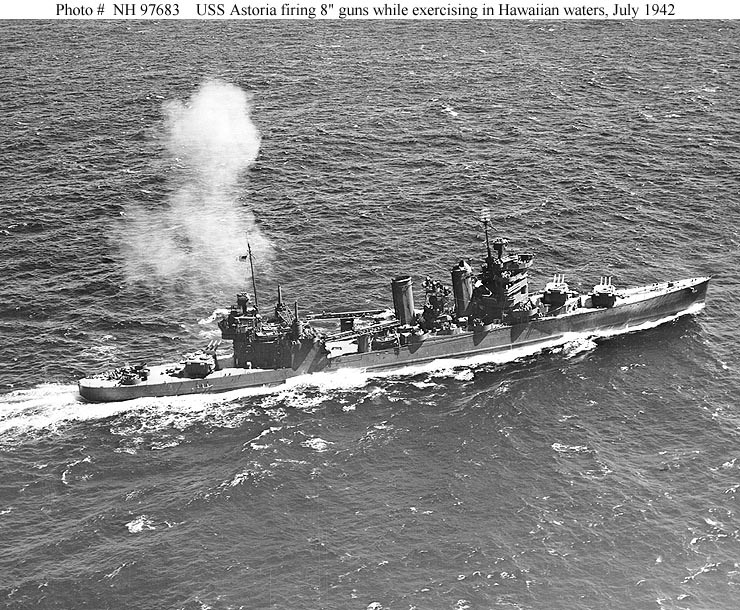 186k USS Astoria (CA 34) firing her after eight-inch guns, during battle practice in Hawaiian waters, circa 8 July 1942. Official U.S. Navy Photograph, from the collections of the Naval Historical Center #NH 97683. Guadalcanal-Tulagi Invasion, August 1942. 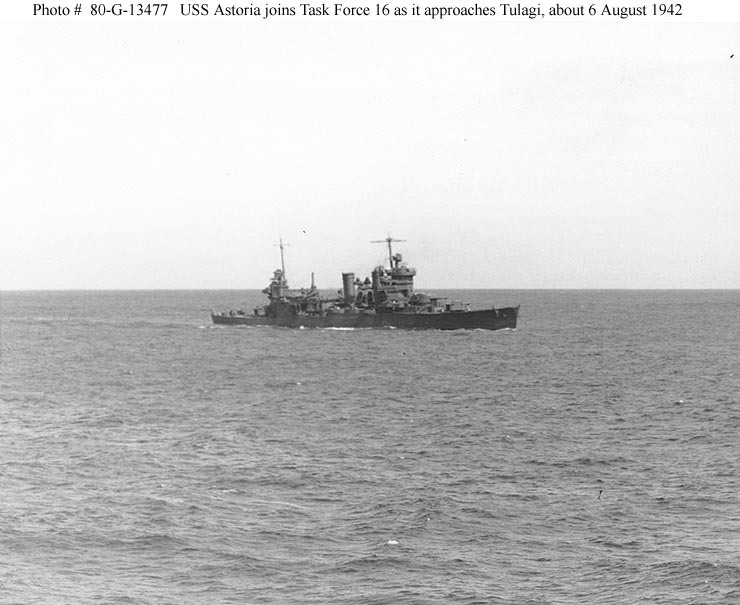 USS Astoria (CA 34) joins Task Force 16 as it approaches Tulagi, about 6 August 1942. Official U.S. Navy Photograph, now in the collections of the National Archives #80-G-13477. 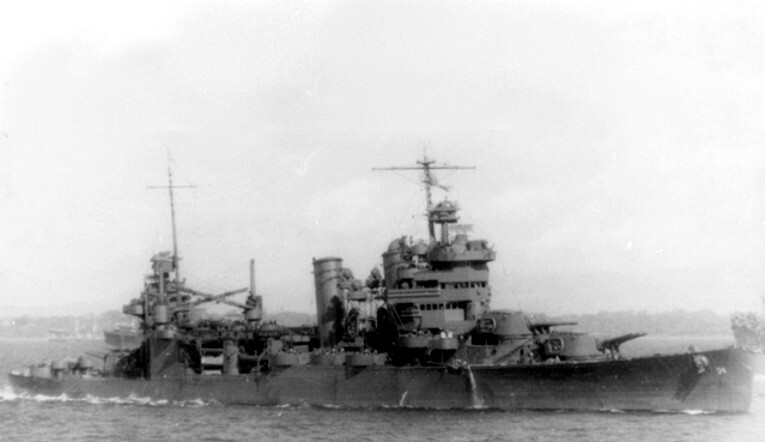 U.S. Navy heavy cruiser USS Astoria (CA 34) off Guadalcanal on 8 August 1942. Australian armed forces. 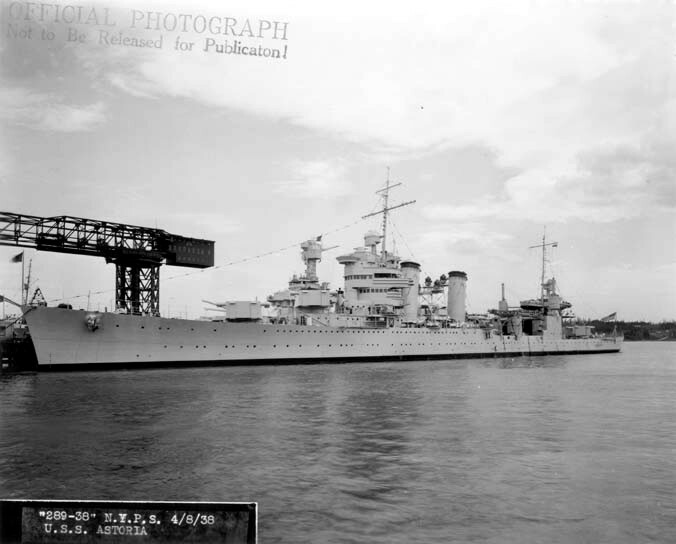 This image is available from the Collection Database of the Australian War Memorial under the ID Number: P01233.007. Battle diagram showing ship movement during Battle of Savo Island on 9 August 1942. 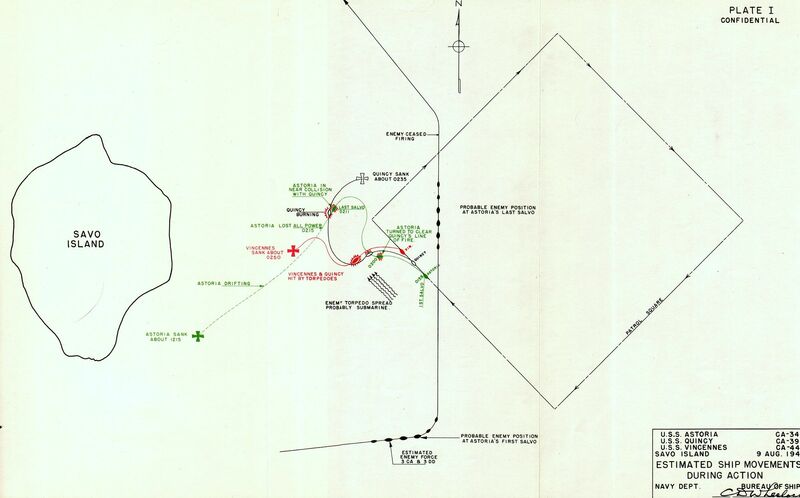 Source: Preliminary Design Branch, Bureau of Ships Navy Department, War Loss/Damage Report No. 29. 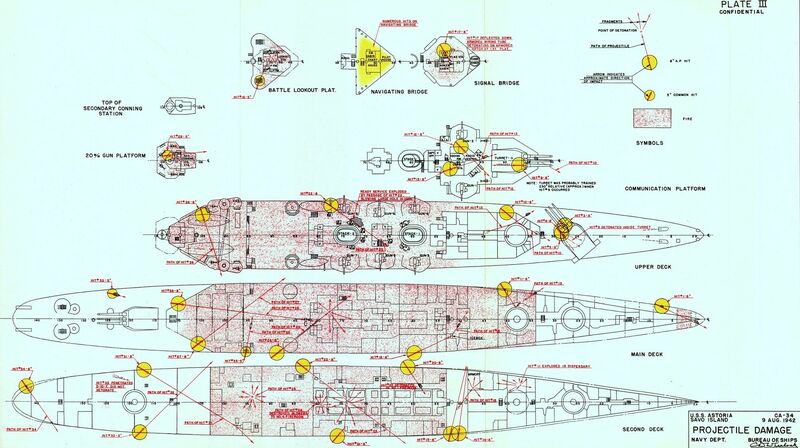 Outboard profile battle damage diagram of USS Astoria (CA 34) showing gunfire hits during Battle of Savo Island on 9 August 1942. Deck plan diagram of USS Astoria (CA 34) showing gunfire hits and location of fires during Battle of Savo Island on 9 August 1942. 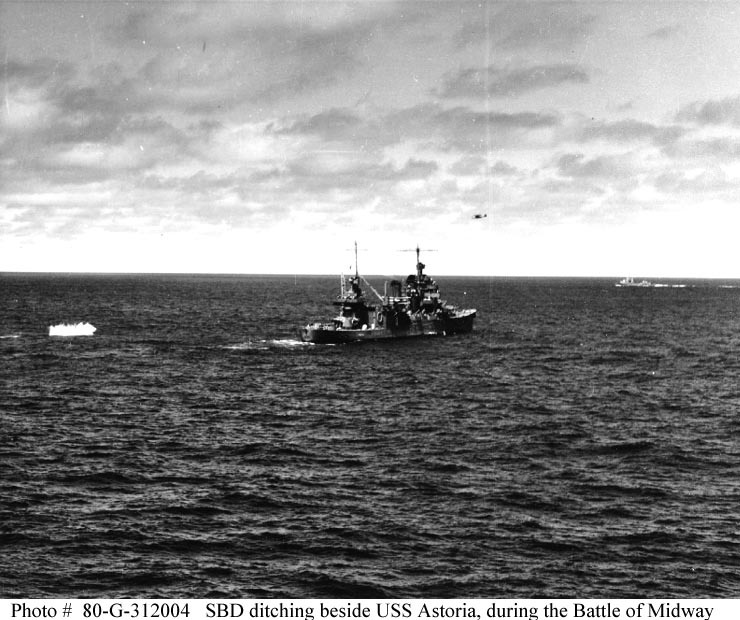 USS Quincy CA39, USS Astoria CA34 & USS Vincennes CA44 Loss In Action - Battle of Savo Island 9 August 1942 from the Naval History and Heritage Command.